Tutzing, Germany, 20 May 2006 – His Highness the Aga Khan, Imam (spiritual leader) of the Ismaili Muslims and founder of the Aga Khan Development Network (AKDN), said today that the revolutionary impact of globalisation and record levels of international migration require development of a new “cosmopolitan ethic” to support constructive pluralism and greater tolerance among different cultures and societies. He was speaking at the Evangelische Akademie Tutzing (Evangelical Academy of Tutzing) where he received the Tolerance Award in recognition of his efforts to promote greater understanding and respect between peoples and cultures and for his dedication towards social, cultural and economic development in some of the world’s poorest countries. In accepting the Award, the Aga Khan noted that increasing global migration means “peoples who once lived across the world from one another now live across the street”. It meant overcoming animosities that are often born out of fear or a lack of understanding of those who are different as well as learning to work together in the hope of a better future. Germany’s Evangelische Akademie Tutzing is renowned for bringing together leaders of political, cultural and religious thought. The Tolerance Award was established by the Academy in 2000 and is presented every second year to an individual whose life work is committed to building greater understanding and tolerance between different cultures and traditions. German Minister of Foreign Affairs, Dr Frank-Walter Steinmeier, delivered the laudatory address for the Award presentation and praised the Aga Khan for his philanthropic activities and his efforts to promote greater tolerance in the world. During his laudatory address, Dr Steinmeier described the Aga Khan as a “fortress for democratic progress, as someone wishing to bring about sustainable, pluralistic, civil societies”. The Aga Khan drew on his personal experience as an individual educated in the West, while having spent nearly 50 years working largely in the developing world, saying that his commitment to the principle of tolerance grows out of his religious faith and his role as hereditary Imam of the Ismaili Muslims. He said the ancient teachings of Islam, like those of other great religions, affirmed both the unity of humanity and the diversity of mankind. Despite the long history of religious conflict, he noted, there is also a counter-history of religious focus on tolerance as a central virtue. "When people speak these days, about an inevitable “Clash of Civilisations” in our world, what they often mean is an inevitable 'Clash of Religions,' explained the Aga Khan. The essential problem in relations between the Muslim world and the West was, rather, a “Clash of Ignorance” which had to be addressed by “a concentrated educational effort”. The Aga Khan is the fourth recipient of the Tolerance Award. 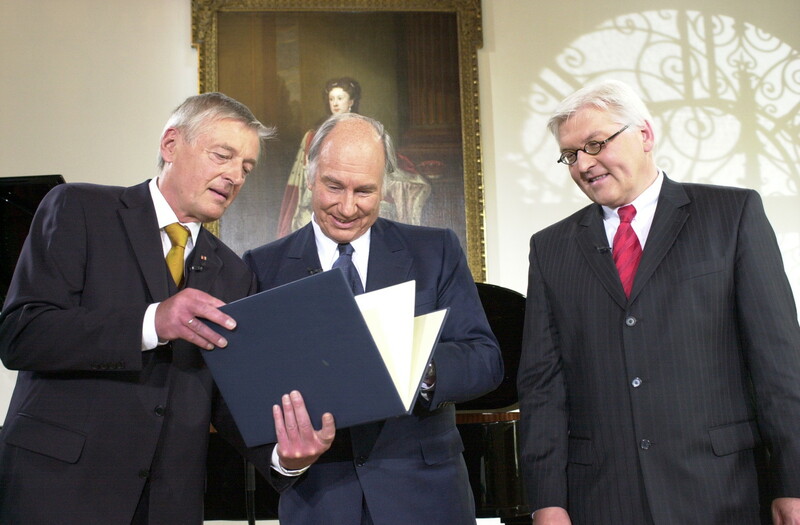 The first winner in 2000 was former German President Roman Herzog, who received the award for his efforts towards intercultural and interfaith dialogue. Daniel Barenboim, distinguished pianist and conductor, received the second award in 2002 for his extensive efforts to bring Palestinians and Israelis together through music. The 2004 award winner was Swedish author, theatre producer and director Henning Mankell who endeavoured to raise awareness as a keen activist for development and change in Africa, particularly during the apartheid regime in South Africa. Notes: The Aga Khan is the 49th hereditary Imam (spiritual leader) of the Ismaili Muslims and a direct descendant of the Prophet Muhammad (peace be upon him). A Harvard graduate in Islamic history, the Aga Khan, succeeded his grandfather as Imam of the Ismailis in 1957. He is the founder of the Aga Khan Development Network, a group of private, non-denominational development agencies whose mandates range from health and education to architecture, culture, rural development and the promotion of economic development through private-sector enterprise. It operates in 30 countries, seeking to empower communities and individuals – often in disadvantaged circumstances – to improve living conditions and opportunities, especially in countries in sub-Saharan Africa, South and Central Asia and the Middle East. The AKDN relationship with Germany began in 1992, and in 2004, AKDN signed a Memorandum of Understanding with Germany’s Federal Ministry of Economic Cooperation and Development (BMZ) for strengthening development cooperation. Today, AKDN is engaged with German institutions in 40 projects across nine countries, in six sectors. Last year, the Aga Khan was awarded the Quadriga Prize in Berlin, Germany, in recognition of his life’s work.